The board is rectangular, not square like the one I had circa 1983. This makes the map look a bit more like the world map projection I usually see used, much less distorted than on the square board. The countries are very brightly colored, causing some problems with piece recognition as I’ll detail later on. LL and I initially thought that there had been some geographic changes but it looks to me as if a few names have been changed to keep up with the times and that’s about it. The playing pieces are plastic figures, with a single soldier representing one army, a soldier on horseback representing five armies, and a crewed artillery piece representing ten armies. Seems the set I had back in the day had plastic Roman numerals: I, III, V, and X. LL remembers something similar. I know these change with the time: LL has a really old version with wooden pieces…and the modern Target-only version has wooden pieces as well. Our biggest complaint about the pieces, apart from being a bit fiddly, was their coloration. The red, blue, and yellow armies are pretty distinct and easy to pick out on the board. The other three are orange, dark grey, and olive-drab green. The grey and O.D. army pieces are very hard to tell apart on the board. The orange army pieces can look like yellow or red, depending on which brightly colored country space they’re in. The bright colors of the countries, though tasty, detract a bit from the playability of the game because you often have to look twice to figure out the color of the army sitting in it. The cards no longer contain infantry, cavalry, or artillery symbols for set-building. In the last version I played, the sets were worth different values depending on whether you had a set of three of the various types or one of each. Three cards made a set and you had to turn in cards if you were holding five or more at the start of your turn. I think there might have been an optional rule for increasing the number of armies received with each set turned in. I also seem to remember something about bonus armies if you controlled a territory pictured on a card in your set…but that might have been a house rule or something. In the new version I purchased, each card has either one or two stars. You can turn in any number of cards totaling at least two stars to receive bonus armies at any time during your turn, not just at the beginning of it. You receive progressively more armies for each additional star turned in. There’s a cheat-sheet printed on the board. It stops at ten stars, but I guess it’s not likely you’ll turn in more than that in one go. The progression starts with two armies for two stars and ends with 30 armies for 10 stars…you start seeing some nice increases at around five or six cards. The two-player game incorporates neutral armies. To start, each player gets twelve cards and places one or two armies on those territories, depending on how many stars are on the card. The three neutral players get six cards each and do the same. Then all of the cards are shuffled and the neutral players get three cards each. At the start of each players’ turn, before placing their own armies, they must choose a neutral player and place three armies on territories held by that player. If a player conquers the last territory held by a neutral player they take that player’s three cards and add them to their own. The neutral players don’t attack but defend normally. Neutral players may have been part of the rules for a while now but it was the first time LL and I have played with them. They certainly changed the way the game is played. We rarely fought each other’s armies…but spent a lot of time chewing on piles of neutral armies placed to stop our progress. It was interesting. Also, taking out a neutral player gives you three more cards, which you can add to your own and turn in right away. This happened in our game when I was holding five cards (but only five stars) and got three more (with four stars) for taking out the yellow neutral player. That gave me nine stars for 25 armies and those armies gave me the juice I needed to take two continents away from LL, tipping the balance of the game. Watch out for your opponent if they’re holding on to cards! Well. Those are the significant points I can remember. We started a two-player game with neutral armies as detailed above. 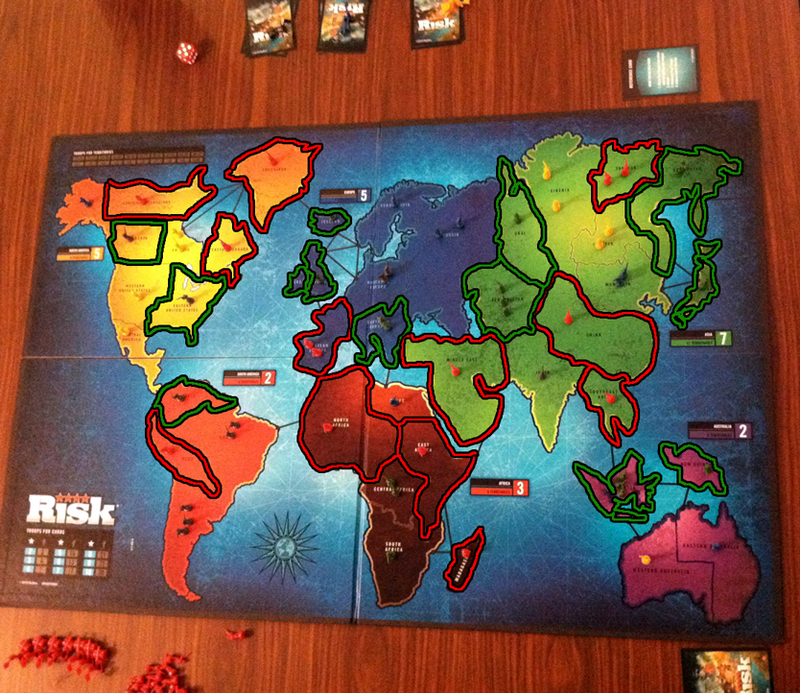 We rolled off and I got to make the first move…usually a good thing in Risk. I didn’t like LL’s dominance in Africa, so I put three neutral blue armies in Egypt. I did like my position in Australia and wanted to go for it, so I put my three armies in Indonesia and tried to make a push for Western and Eastern Australia, both held by neutral armies. You can see the board at this point in the image at right (click to enlarge). I’ve highlighted the countries held by LL (red army) and me (green army) so you can see them clearly…the combination of poor photo and muddily colored pieces makes it hard to tell what’s what! Anyway, I ended up taking Western Australia but failed in my move east. On LL’s turn, of course, she bolstered the neutral blue armies in Eastern Australia with three more. She then proceeded to take the neutral grey holdings in Central (we still call it Congo!) and South Africa. We kept on like this for a bit and I’m not going to give a play-by-play, because that would be boring as heck. LL reinforced blue in Eastern Australia for a few turns and I kept dashing myself against it, while taking out her holding in Southeast Asia so she couldn’t take an active role there. I kept reinforcing blue in Egypt and she attacked it a few times before moving on to take over South America. She made a quick card turn-in that let her gain that ground quickly. I finally won out with a desperate push (and lucky die rolls!) against Eastern Australia but managed to hold on to the cards I was collecting. After that, LL made another small card turn-in and pushed up into North America, quickly eliminating my positions there. I did the same in Asia, getting rid of her holdings so she couldn’t counter-attack me. Here’s where things got interesting, however. LL took out the three neutral yellow positions in N.A., leaving the two with two armies each in my back yard. She had been growing nervous about my stack of cards, which now totaled five, and the untried turn-in-anytime rule…and her instincts were right. I had grabbed enough territories to get a couple of extra armies at the start of my turn and plopped them into Yakutsk, proceeding to roll well and eliminating the yellow neutral player. That gave me stars enough for 25 armies. I plopped them into Afghanistan and proceeded to take all of LL’s holdings in Africa, South America, and stick a toe into North America, leaving a big pile in Central America to prevent her taking it back. I stopped the attack to avoid overextending myself but we both thought the writing might be on the wall. LL took what was left of her forces and another small card turn-in (if I’m remembering correctly) and came into Asia out of Alaska for a final push. She made it down into Indonesia and was able to reinforce with a couple of armies from Greenland at the end of her turn. By that time, however, I held South America and enough territories that I received quite a few armies on my turn. I put them into Australia and pushed back, reversing her gains. We called the game at that point. 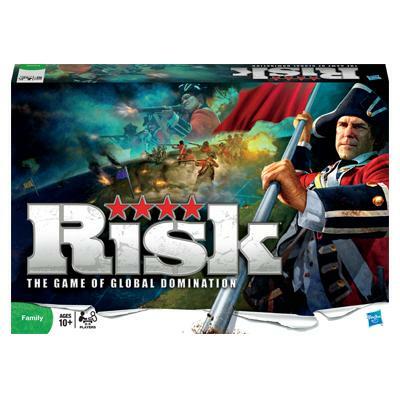 Risk has always been a game that could turn on a good card turn-in or a rash of sorry dice rolls and I think that the new (to us) card turn-in rules make that even crazier. We’ll play some more and adjust to the new strategies suggested by the game. I predict that the next session will take a while longer! Now, if only I can catch up on blogging all of the gaming sessions I’ve missed!